This image was chosen by another friend, and was started on July 4, 2002. It was completed on Sept 30, 2003 while listening to great music at the Strawberry Music Festival near Yosemite Valley in California. The sword uses two strands of floss, and all of the figure has only one strand to capture the detail. Many areas require several layers of different colors to acheive the blended look and subtle changes of shade. As the finished piece was being attached to the leather vest, its future owner told us that Ian Anderson (founder and flautist of Jethro Tull) would be coming to the San Francisco Bay Area with his Rubbing Elbows Tour. He suggested that we should take the vest for its first public outing and wear it to the concert. Maybe, somehow, we would even have an opportunity to show it to Ian in person. The Rubbing Elbows Tour was designed to be audience accessible, with a local DJ acting as emcee, question and answer opportunities, and even two audience members chosen to come up on stage and sit on the "comfy couch" for a more intimate conversational experience. We got our tickets and sent an e-mail to Ian through jethrotull.com, hoping that we could set the stage for some kind of personal contact. Well, we didn't get up on the couch, or even chosen to ask a question from the audience, but the concert was in the intimate and beautiful Palace of Fine Arts, and we were in the fifth row, feeling as though we were looking Ian right in the eyes as he played and told stories of his musical exploits. After the concert, following the suggestion of the DJ emcee, we waited at the stage door for an hour and a half, hoping to have our chance to share this homage to one of our favorite bands. One by one, we watched the stage hands, assistants and most of the other band members leave, and though several of them saw and were impressed by the embroidery, none were able to get a message to Ian or tell us when he might emerge. Then, a voice came out of the darkness behind us announcing that Mr Anderson would be arriving in a vehicle and would stop to sign one object for each of us if we lined up in an orderly fashion. Sure enough, an SUV pulled up and we stepped up to the window one by one to find Ian Anderson graciously signing autographs. Though the lighting was less than optimal, someone held a flashlight on the vest as I slipped it through the window, and my husband put his hand in just in time to stop Ian from automatically signing right in the middle of the image! He leaned in to inspect it closer, looked me right in the eye and asked "What is this?" 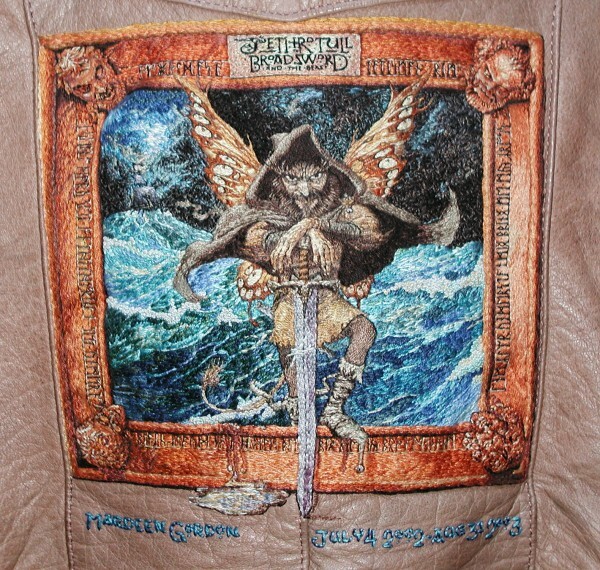 I explained that it was a hand-embroidered reproduction of one of Jethro Tull's album covers, that it had taken a year and three months to complete, and gave him the link to this website if he wanted to learn more. He commented that he particularly liked the colors in the ocean, and as you can see, he signed "Hello! Ian Anderson - Tull" on the leather above it. It may have been only 30 seconds in the dark, but it was the closest I have come to sharing my work with the person who was the source of my inspiration.